The TOC-L series of TOC analyzers adopts the 680°C combustion catalytic oxidation method, which was developed by Shimadzu and is now used worldwide. While providing an ultra wide range of 4 μg/L to 30,000 mg/L, these analyzers boast a detection limit of 4 μg/L through coordination with NDIR. This is the highest level of detection sensitivity available with the combustion catalytic oxidation method. In addition, the combustion catalytic oxidation method makes it possible to efficiently oxidize not only easily-decomposed, low-molecular-weight organic compounds, but also hard-to-decompose insoluble and macromolecular organic compounds. including pure water measurements, and a standard model designed with cost performance in mind. 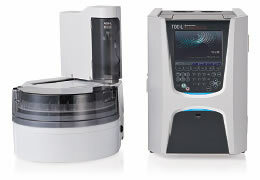 Each analyzer is available as an LCD and keyboard-equipped standalone model, or as a PC-controlled model. In addition, the USB format has been adopted as the external interface, enhancing the equipment’s versatility. Even the standalone models are capable of output to a general-purpose PC printer or to a USB memory stick. 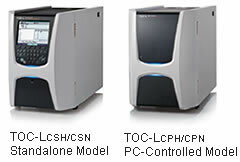 With the TOC-L series, numerous options enable a variety of functional enhancements. 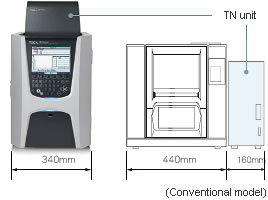 These include simultaneous measurement of TOC and TN (total nitrogen) (when a TN unit is added), the use of compressor air (when a carrier gas purification kit is added), and the measurement of gas samples and solid samples (when a gas sample injection kit and solid sample combustion unit are added). Sea water sample measurement and small sample volume options have also been enhanced.